As a Cisco Gold Certified partner, we work at a fast pace throughout the year to evolve with the many technology changes—and this allows us to add significant value to our clients and execute on complex IT solutions. 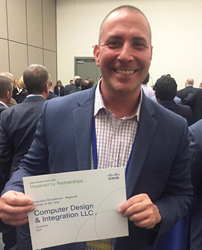 Computer Design & Integration LLC (CDI LLC) announced today that it has been honored with the Cisco Execution Excellence - East Regional Partner of the Year Award for their demonstrated innovation, leadership and best practices as a business partner. Cisco unveiled these winners at the Cisco Partner Summit, which was held Feb. 29 - March 3 in San Diego, CA. Cisco Partner Summit Theatre awards reflect the top-performing partners within specific technology markets across the country. All award recipients are selected by a group within the Cisco Global Partner Organization, and regional and theatre executives. As a Cisco Gold Certified partner, CDI LLC delivers value-added solutions and proven technical expertise in specific technologies, with a sharp focus on customer satisfaction in a targeted geography. "To be recognized by Cisco for our achievements is a tremendous accolade, as everyone at CDI works so hard to provide solutions and services for our clients,” said Frank Romano, vice president, Engineering and Service Delivery, CDI LLC. “As a Cisco Gold Certified partner, we work at a fast pace throughout the year to evolve with the many technology changes—and this allows us to add significant value to our clients and execute on complex IT solutions," he added. The Cisco Partner Summit is attended by more than 2,100 global attendees from Cisco’s eco-system of partners, representing more than 1,000 companies worldwide from more than 75 countries. CDI LLC was founded in 1995, with corporate headquarters in Teterboro, NJ, as well as office locations in New York City, Philadelphia, Charlotte and Atlanta. The firm has been recognized as one of the nation’s top 500 IT solution providers offering clients and businesses of all sizes the most up-to-date hybrid IT technology solutions that solve today’s most complex business challenges. CDI LLC continually focuses on achieving client satisfaction by developing and implementing comprehensive and innovative technology solutions that enhance day-to-day business workflow processes. As one of the largest solution providers, CDI LLC combines the required experience, exceptional talent, quality assurance and stability that its clients strive to achieve. For more information, visit cdillc.com or call 1-800-234-5531. Follow us for continual coverage on Twitter @cdillc or via our YouTube Channel.